Ariana Grande and Little Big Town Lit Up the Country Music Awards! It is such a delight to be able to share what was a top secret project. Ariana Grande and Little Big Town were the hit of the Country Music Awards ceremony with their fabulous outfits we made for them using our double density RGB LED light roll, by none other than Cool Neon’s own, Benny James! We are pretty excited! This is what they looked like in our workroom! And here is a video! The costumes got a lot of press. We especially like the Billboard mention, click HERE to see it, and they even mention Katy Perry’s costume, which was also made right here in our workroom. E! Online also gave the costumes a shout out and also referenced Katy’s costume, click HERE to read it. It has been an exciting year and we love sharing it with you. Halloween Costumes! 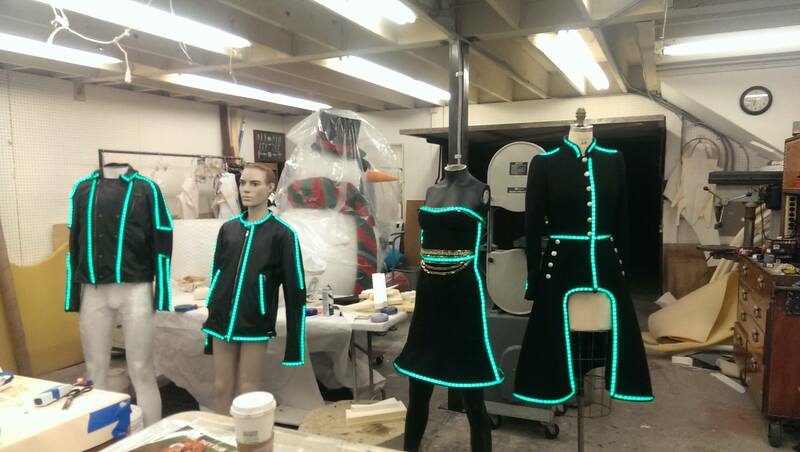 So You Can Be the Brightest Costume on the Block! Blue Media Uses Hella Phat Cool Neon Wire for Phatabulous Sign!